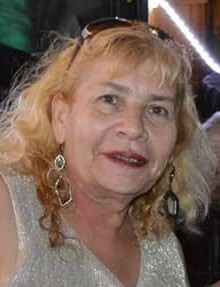 Margaret “Peggy” Ann Martinez, affectionately known as Mama Bear, 60, passed away on September 8, 2018. She was born in January 24, 1958 to James and Vivian (Lucero) Martinez who both precede her in death, along with her son, Matthew Martinez. Margaret loved to dance, sing, play cards, eat Passkey and watch Bronco games. She leaves behind to cherish her memory, sons; Elias and Salvador (Deserea) Gonzales, Ray (Charlotte), Rocky and Rico (Ashley) Martinez. Family will receive friends at Zaragoza Hall following service. Memorial service 10 a.m Tuesday September 18, 2018 Angelus Chapel.